A few days ago I rented some more shop time. Now that I’m paying to blow glass I’m being much more careful about making things I know I can finish quickly and sell. 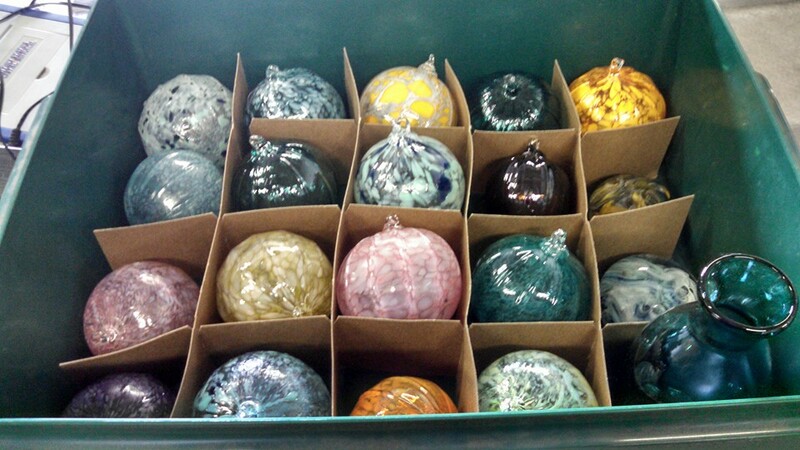 I’ve sold a few ornaments that I made last time, so I’m hoping I can keep selling enough to buy more shop time. A few weeks ago I made my first batch of ornaments for the season. I made about 10 in two hours. This time I was able to make 20 things in the same amount of time. What’s even better though is that the ornaments I made weighed less overall. Making ornaments thin is tough! It’s something I’ve never done all that well. But with practice lately mine have been getting thinner and thinner. I don’t have much color at the moment. I’ve been making mixes with some of the leftover frit I had from other projects and even crushing up some of the bar I had to make frit. I’ve learned a few good lessons so far about which colors interact well with each other. So far I’ve gotten a few ornaments out of the annealer that were just hideous because I didn’t know the colors would look so bad together. Once I order some more color I want to start making some vases, tumblers and other projects for after the Christmas season is over.